Few gyms in the Hudson Valley area of New York offer the eclectic and effective striking art of Muay Thai kickboxing. Fewer still have a facility which accommodates serious striking training. Believe it or not, many martial arts’ gyms do not have proper equipment, lack heavy bags, pads, and most do not even have a ring to train in. At best, these gyms are lacking in some quality training tools, and at worst, they can be overcrowded, chaotic and at times, unsafe. Many of these problems are due to lack of training space. Precision MMA in Hudson Valley, New York was already the premier Muay Thai gym in the area, but now that we have added 500 square feet of mat space, we are better than ever before. nd perhaps see no need for increasing it. Precision MMA originally had a very adequate 3,500 square feet of training space which we have increased to 4,000 feet just to accommodate our students. Other Muay Thai gyms which lack the space we have can actually be dangerous. It is difficult for multiple sparring sessions to go on at once in a tight space because different groups of training partners can accidentally collide with each other leading to injuries. No one wants this and yet, some schools refuse to make renovations to lessen the chances of this happening. Instead, if they perceive that multiple sparring sessions at once may increase the chances for injury they may only allow one or two groups to spar at once, which wastes the training time of all those sitting on the sidelines waiting for their chance. Or otherwise, they may allow multiple groups to spar at once without taking the hazards into account, and this could create disaster. Precision’s Muay Thai program in the Hudson Valley has a spacious 4,000 square feet of mat space for our strikers to utilize, which includes a 20 by 20 foot boxing ring, something that many other schools do not offer. The extra mat space also allows our Muay Thai students the room to make use of our many different training tools which include a maze bag, an uppercut bag, a heavy bag, a speed bag, a bob bag, a double end bag and a long bag. We also have a great assortment of focus mitts which get a great deal of usage, as well as multiple jump ropes, a crash pad for practicing takedowns, and a foam roller to help us deal with muscular aches after our hard Muay Thai sessions. Clearly Precision MMA’s Muay Thai program in the Hudson Valley has been streamlined for success. We are never satisfied with the bare minimum and are constantly striving for improvement. Our extra training space has even given our instructors more new ideas for how to increase the quality of our product. Keep an eye on Precision in the Hudson Valley because there’s more to come in the way of accommodations. 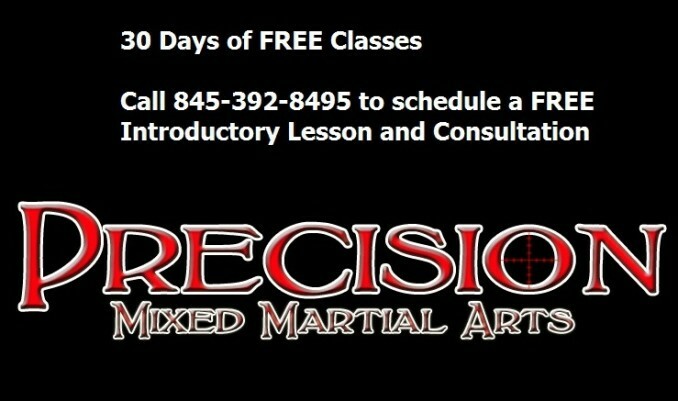 Precision MMA is currently offering a 30-Day FREE trial for new members. If you’re interested in learning self-defense, getting into shape, and training with the best in the area, then stop in at 1097 Route 55, Lagrangeville, NY or call us at 845-392-8495. Don’t forget to ask about our free trial and intro lesson! Not all boxing programs are created equal. Some are only for the hardened veterans, those who have competed before and just need a little tweaking here and there by expert coaches in order to further their potential. These gyms tend to overlook the beginners and those who are looking to box casually. Precision MMA in Dutchess County has a boxing program which never overlooks the casuals or the novice students. We have teachers who are patient and will work to help anyone who is willing to put in the time. Our head boxing coach Derrick Ohlhoff, who is a 3 times Golden Gloves’ boxing champion, has been teaching at Dutchess Counties’ Precision MMA for almost five years now. Because he has seen it at all and trained with pro boxers like Zuri Lawerence and Brian Barbosa, but also remembers well his days as a beginner and has seen what it takes to get new boxers to a high level, he is quite adept at teaching the new prospects who walk through our doors. Derrick is extremely patient and has a good sense of humor which attracts younger boxers who might at first be a bit intimidated and expecting that boxing will be a grueling affair with strict coaches. Derrick is all about the fundamentals, and these are what beginners need more than anything else. He lets the novice students know when they are experiencing progress every step of the way, since new boxers may often not realize that their technique is improving with rapid speed, and being told so increases their confidence and makes them want to attend more classes. Dutchess County’s boxing program at Precision MMA also has a great coach in Jon Russo. Russo is also excellent at teaching beginners because not only does he also have ring experience but he has a great sense of humor and is truly one of the “young at heart”. Russo has also trained in Martial Arts such as Jeet Kune Do and Taekwondo and has a keen eye for practical self-defense, so this combined with his sense of playfulness has allowed him to create many fun and creative training exercises for the beginners. The younger students in particular rave about Jon’s training methodologies and are always wondering what new training technique he might introduce next. He has all the fundamentals of boxing down, yet is not one to think rigidly and can adjust his teaching methods to his students’ personalities. Finally, Jon Joy is perhaps our most beginner-friendly coach. This is probably because despite the fact that Joy has improved tremendously in record time and now has several amateur boxing wins under his belt, it was not long ago that he was also a beginner learning the sweet science in Dutchess County at Precision MMA. Remembering what was imparted to him early on, Joy focuses intently on those fundamentals so essential to early progress in the sport of boxing, such as footwork and head movement. Because Precision MMA in Dutchess County has three patient, good-natured instructors with varying teaching styles we are an excellent gym for beginning boxers. Don’t be shy, come box with us for 30 free days and you’ll be hooked in no time. Not all Mixed Martial Arts gyms in Dutchess County, or anywhere for that matter, are created equal. Aside from all the skills necessary to successfully teach martial arts classes, knowing what equipment is necessary for a good facility and having an eye for presentation are entirely different matters. Many Mixed Martial Arts instructors tend to believe that teaching is everything and entirely neglect the training space in which they teach, feeling that the lessons are the only important thing. Many a world class Brazilian Jiu-Jitsu black belt has been known to teach out of their garage or in their basement. While it is true that the die-hard Mixed Martial Artists and Brazilian Jiu-Jitsu practitioners will train just about anywhere so long as the instruction is quality, we must remember that they only comprise maybe 5-10% max of those who seek out instruction. In fact, of those serious mixed martial artists, most of them started off casually and may have been turned off by an uncleanly, unkempt and cramped facility if they had been looking for a top notch school. In addition to this, many future mixed martial artists start as children needing their parents’ consent, and so it is important that a facility not only looking good to the trainee, but also his or her legal guardians, as well as the passers-by in the street who may be put off by an unattractive training space. Precision MMA in Dutchess County, New York has recently made renovations to make it even more use-friendly and attractive to the general public, as well as more useful to its long time students. In this blog we will cover some of the changes made and aspects which make Precision MMA the premier training facility in Dutchess County. Precision Mixed Martial Arts in Dutchess County, New York is a total of 5,000 square feet including the waiting area, the mat, the ring, the bathroom and changing room. This is already a much larger facility than most martial arts gyms. We had previously had only 3,400 square feet of training space, in terms of the training mats and boxing gym, but recent renovations have added 600 square feet of mat space to our facility, giving us a whopping 4,000 square feet of training space. The fact that even decided to make any renovations at all, given that the amount of training space we had previously had was already twice that of the total space of many gyms, shows our students and potential students that we are always striving for improvement. 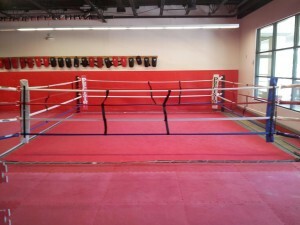 Some of the renovations, like the repositioning of our 20 by 20 foot boxing ring, something else most gyms do not offer, had to do with the fact that we felt the ring itself sometimes got in the way of the kids classes. Children would sometimes stray towards the ring area, making the class a bit more chaotic. For this reason, in addition to our desire to offer more mat space, we decided to move the ring to the corner of the gym and knock down one wall. The result has been nothing less than astounding. The ring is no longer a hindrance during the kid’s classes and all of our students have been raving about the extra mat space which also makes us a safer facility because students are less likely to collide into each other while practicing takedowns. This an important point to make because many other Mixed Martial Arts schools in Dutchess County do not even include takedowns in their curriculum because of lack of space. Precision Mixed Martial Arts in Dutchess County offers just about every sort of training equipment a student could want. Along with our extensive mat space and 20 by 20 foot boxing ring, we have an assortment of bags which can be used for striking, including heavy bags, slip bags, long Thai bags, double end bags, uppercut bags and a human shaped training dummy we affectionately call “Bob”. We also have multiple other types of training equipment, such as pull up bars, resistance bands, a crash pad, zebra mats and medicine balls. Most other Mixed Martial Arts schools in Dutchess County do not have this wide assortment of training equipment. We also have an assortment of hand-held pads for our Muay Thai and Boxing classes, including kicking pads, Thai pads and punching mitts, all which have their own antimicrobial bio-shields to insure that none of our students who use them contract any sort of skin conditions. In addition, we have multiple jump ropes, foam rollers which can be used for any cramps developed during training and a very useful timer we use to keep track of the length of our Mixed Martial Arts, boxing and Muay Thai rounds for our aspiring fighters. We even have padded walls which are very useful for Mixed Martial Arts training for simulating the surface of a cage and which prevent injury. Again, most mixed martial arts gyms do not offer all this equipment, in fact, many necessaries are ignorant to the many uses these training tools have, and it is their students who lose out in the end. In addition to training equipment, Precision Mixed Martial Arts in Dutchess County has many other features which make its’ facility accommodating to students, aspiring students, parents and visitors in general. Because we have so much mat space we are able to teach two classes at a time, which is very convenient for both our students and instructors. To accommodate this we include two large dividing curtains which can be placed between separate classes so that the training spaces are kept separate. We also have a good sized changing room for our mixed martial arts students, something which many gyms do not have, forcing their students to have no option other than to change in the bathroom. Of course, we also have a sanitary bathroom including a shower, another feature most schools do not have, and which helps many of our students who drive longer distances from contracting contagious skin diseases by rapid washing after class. We also have large leather couches for parents of students and visitors, benches for our students to sit on, so they don’t get the couches sweaty, a cabinet where students’ shoes can be kept, as well as a fridge a flat screen TV and dvd player, and a desk and computer for our employees. We are also keep our gym sanitary at all times, mop all mats and the ring at least once or more a day, and spray down all equipment, which are measures that many schools do not take and which result in the spreading of infectious skin diseases. As can be seen, the new and improved Precision Mixed Martial Arts in Dutchess, county New York has all its bases covered as a facility. Come by and check us out for 30 free days and you will not be disappointed. Without a doubt the most popular striking art practiced by mixed martial artists these days, such as those who train at Precision MMA in Dutchess County, New York, is Muay Thai Kickboxing. Dating back to seventeenth century Thailand, this style has proven to have lethal effectiveness on both the battlefield and in the sport arena. However, its uses are not confined to sportive competition or militaristic use by ancient Thai and Siamese armies. This multi-faceted form of combat is extremely effective for civilian self-defense scenarios. Additionally, Muay Thai workouts are excellent for getting into peak physical condition and form the basis for many cardio kickboxing programs across the country. Precision MMA in Dutchess County, New York is one gym which offers a Muay Thai program capable of getting anyone into shape in record time as well as providing effective skills for use in practical street self-defense. Muay Thai Kickboxing, as it is taught at Precision MMA in Dutchess county New York, is one of the most effective styles in the world for self-defense. This is because the art has such a wide repertoire of strikes, trips and clinch tactics, as well as specific defenses to all these attacks. Muay Thai could best be described as a form of striking which combines the punches of western boxing, with it’s own unique brand of kicks, generally delivered with the shin, as well as elbow and knee strikes. Students are taught to strike with multiple different surfaces, such as the shin, ball of the foot and heel for kicks, the front and back of the knuckles for punches, the points and sides of the knees for knee strikes, and the points and sides of the elbows, as well as the forearms, for elbow strikes. Likewise, Muay Thai teaches the student to condition various parts of their bodies, such as the shins and forearms, in order to be better able to defend against strikes. Muay Thai Kickboxing practitioners are also taught to strike from a number of different angles. With their hands they are taught the conventional jab, cross, hook and uppercut from western boxing, but other more unconventional techniques are also taught such as spinning back fists and superman punches. All forms of kicks are employed, such as roundhouses, front push kicks referred to as “teeps”, and any number of different flying and spinning kicks. Muay Thai is perhaps most known for its knee and elbows strikes which are particularly useful for self defense because most attackers would probably not see them coming as easily as a typical overhand right or a jab. A mugger or assailant would be more likely to expect a would-be victim to throw a punch rather than a spinning elbow or flying knee. Local AKBG kickboxing champion Karl Nemeth teaches techniques such as these in great detail at Precision MMA in Dutchess, County, New York. Karl is a student of none other than world renowned Muay Thai champion Kaensak Sor Ploenjit, so his students get their knowledge of the style straight from its source. Not only does Muay Thai employ a vast arsenal of strikes, it also teaches very specific clinch tactics which make the art even more useful for self defense because stand-up grappling scenarios are very common during assaults. One cannot expect a violent encounter to take place at one specific range. An attacker is not going to politely stand at kicking distance and then move slowly and gradually into punching range, for example, in order to give the victim time to throw the perfect strike. Instead, the assailant might simply rush the victim and initiate a standing clinch. Muay Thai, as it is taught at Precision MMA in Dutchess County, has all the answers for such an attack. For example, one of Muay Thai’s defensive tactics for a standing bear-hug would involve pushing the attacker’s chin upwards with one’s palms in order to break the grip, then grabbing the back of the attacker’s head in what is known as the “thai plum”, and driving one’s knee into the attackers’ face. This would be a very common scenario one might encounter in a violent attack. Likewise, a mugger might attack with a standing headlock, and from such a position the typical kicks and punches taught in many striking styles might not be effective because of the close proximity. However, for such a situation Muay Thai’s knee and elbow strikes would work perfectly because distance is not necessary to achieve forceful impact. Muay Thai also employs a number of standing trips, takedowns and leg sweeps, which could be very useful in a street altercation. Many striking styles do not teach these tactics, but Muay Thai as it is taught at Precision MMA in Dutchess County, includes a number of foot sweeps and throws common to the style as it is practiced in its homeland. While in the ring these takedowns are not likely to end a fight due to the soft surface of the canvas, one good sweep on a concrete or otherwise hard surface could end an attack altogether. A person trained in the art of Thai boxing might find themselves in a situation where these tactics could be the most effective recourse, and unlike students of other more rigid striking styles they would know how to use these techniques to defend themselves. Finally, the leg kick, as it is taught in Muay Thai, might be the most effective self-defense maneuver for a number of reasons. First, a mugger or violent attacker is not as aware as a martial artist of the multiple different parts of their body which may be open to strikes. The typical street fight is likely to include punches to the head and perhaps to the body, but will probably not include strikes to the legs. For this reason, attacks below the belt are less expected, and therefore, more likely to land. A well placed leg kick to the inner or outer thigh for example, as it is taught to be delivered with the shin bone in Muay Thai, is extremely painful, can be delivered very quickly, and can in itself be a fight ending blow. Unlike a professional kickboxer, the typical mugger has not conditioned his legs to take the impact of a Thai kick. As such, one well-placed leg kick could actually break an assailants’ leg, tear his ACL, or at the very least significantly slow his movement. This is key, because unlike in a kickboxing match, retreat is an actual option. In fact, it is probably the best one. Strikes to the head or body will not prevent an attacker from chasing one, but a kick to the leg will. If the assailant’s ability to run has been hindered, then his chances of harming the victim are greatly lessened. And finally, street fights have very real legal repercussions. A hard blow to the head could break a person’s jaw or nose, give them a concussion, or even cause brain damage or death in a worst case scenario. Even if it was a clear-cut case of self-defense, this could be difficult to prove if the victim is brought to trial for jeopardizing the life of the attacker. However, a leg kick is not a life-threatening blow and so it would be more difficult to prove that the defender had lethal intent should the altercation lead to the courtroom. Not only is Muay Thai the first choice amongst many martial artists when it comes to self-defense, its workouts are second to none as far as conditioning is concerned. Unlike weight lifting or running, which by themselves produce muscular or cardiovascular strength, Muay Thai workouts produce both. Muay Thai padwork is intense and the rapid-fire punches, kicks, knees and elbows thrown by the student will increase both their muscular endurance as well as their anaerobic stamina. The high volume strikes which Muay Thai students perform at schools like Precision MMA in Dutchess County, New York, will help them to develop lean muscle mass akin to that obtained by low weight, high repetition weight lifting. Students will find themselves burning large amounts of calories and losing fat, while at the same time becoming stronger without becoming muscle bound and losing flexibility, which heavy weight lifting tends to cause. As such, Muay Thai students will become faster and gain greater endurance while simultaneously becoming physically stronger. This is not only due to the strikes which Muay Thai students throw, but also because this style traditionally employs a great deal of body weight exercises such as pushups and sit ups, as well as a good deal of jumping rope. All of the body’s muscle groups are incorporated, and students like those at Dutchess County’s Precision MMA will notice the physical changes as their abs and core become tighter and leaner and the muscles in their legs, arms, shoulders and back become more pronounced. The many jumping movements taught in Muay Thai will engage the calve muscles and any number of punches and upper body strikes will engage the triceps, biceps, deltoids and other muscle groups. Students are also taught to take shots to the body, which has benefits in both self-defense and fitness. At the end of many workouts, training partners will lightly punch each other’s abdomens as the other clenches their abdominals. Over time, this creates stronger core muscles capable of taking greater impact and which will also look good come beach season. Dutchess counties’ Muay Thai students also gain flexibility in their classes as stretching is heavily incorporated so that they will be capable of landing head kicks with ease, and if they are interested in getting in the ring they will also spend time conditioning their shins to be able to build up calcium deposits, enabling them to take leg kicks without being incapacitated. The end result is that by combining their workouts with a clean diet, Muay Thai students like those who train at Dutchess counties’ Precision, will eventually be lean and toned, with a low body fat percentage, lower blood pressure and more anaerobic endurance, as well as having greater strength and flexibility. Subsequently, training in Muay Thai at Precision MMA in Dutchess county, New York, will get students into excellent shape in record time, while also giving them the tools to protect themselves from violent attack. The art can entirely transform a person inside and out, making them more physically healthy and more confident as well knowing that they are armed at all times with an efficient tool for self preservation. Come by Precision MMA for 30 free days and try out our Muay Thai program and you will be able to see this transformation in yourself! On Saturday, April 20th, martial arts’ students at Precision MMA in Poughkeepsie, New York were lucky enough to have veteran Professional MMA fighter and Brazilian Jiu-Jitsu black belt Javier Vasquez in the house for a 2 hour no-gi seminar. Having fought in the Ultimate Fighting Championship and amassing a number of victories, all by submission, Vazquez was one of the best martial arts that Precision has had teach for us to date. For this seminar, Vazquez focused on attacks from back mount and rear naked chokes in particular. His attention to detail was magnificent, and his tips for maintain the back and getting the choke finish, unique and innovative. In this article I will explain some of the details outlined by Vazquez in his seminar, and why we hope he will someday come back to give another class. One of the main details that Vazquez focused on was not riding too high on the opponent’s back while in back mount. This is a position that Jiu-Jitsukas and Mixed Martial Artists often lose control of at critical moments in a match or fight. This should not happen, seeing as back mount is perhaps the most dominant position in all of Jiu-Jitsu and mixed martial arts. Students in Poughkeepsie were first shown how to keep an opponent who arches up on all fours from shucking them off by gaining a kimura grip on one of the arms. This grip is then used to torque the opponent’s arm, disrupting his balance and causing him to lose his posture so that the attacking martial artist can begin working on a choke. Following this, martial arts’ students in Poughkeepsie were taught specific methods for maintaining the hooks on an opponent who tries to hip out and also how to get under the chin of an opponent who tries to block a choke with his jaw. Another technique which wowed the Poughkeepsie Martial Artists in attendance was a grip fighting pattern which allowed the attacker to always be one step ahead of the defender in achieving the rear naked choke. Some commented that the hand pattern looked almost like a Wing-Chun technique, another martial art which has become popular in the Poughkeepsie area, but which generally tends to have less effectiveness than Brazilian Jiu-Jitsu, which is offered on the Precision syllabus. Vazquez also taught proper usage of a single leg ride known as “the mulligan” which can be almost as dominant as any double hook back mount, and showed a number of methods for trapping the opponent’s arms, such as the “mission control trap”. This is technique where the martial artist in back mount uses one of his legs to trap one of the opponent’s arm, taking it out of the equation and making the choke much more difficult to defend. The attending students in Poughkeepsie were particularly impressed with this one. The Mixed Martial Artists at Precision in Poughkeepsie, as well as some visiting students from AMA fight club in New Jersey, were very lucky to have Vazquez stay afterwards to watch them work and share some tips from his long fighting career. For many BJJ students like myself, this was the first time we had ever had an actual former UFC fighter critique our movements. Vazquez focused in particular on the importance of not being hit, especially while on bottom, even if it leads to a lull in the action. He stated that he felt MMA is a sport where too often fighters take risks resulting in their own injury when simple self defense could lead to a better outcome, with them still winning the fight and taking less damage in the process. In particular, when he watched me work to escape bottom mount by trying to simply elbow escape as quickly as possible, taking a number of blows in the process, he stated that I was trying to escape too quickly without focusing on taking fewer punches. He showed me how to escape more slowly, taking fewer shots in the process, and for this I was very grateful. He also showed a move for defending strikes while an opponent stands up in one’s guard which he himself had created, which he referred to as “master control”. The move was similar to what we Poughkeepsie martial artists and Jiu-Jitsukas refer to as the “de la Riva” guard, where the outside leg is laced on the inside of the standing opponent’s knee. The other foot is then placed in the hip of the same leg of the standing opponents, and his near wrist is controlled with both hands of the opponent on the bottom. I had never seen this move before and was amazed to see how hard he was able to make it for the opponent on top to hit him, and how he was easily able to strike back, submit and take the back, as well as sweep and get back to the feet whenever he wanted. Though these were only a few of the moves showed by Javier at his seminar at Precision MMA in Poughkeepsie, had he shown no more than these few movements it would have been enough to make the price of the class worth it for the martial artists in attendance. His attention to detail and focus on maintaining back mount, fighting the hands for the choke, and avoidance of taking strikes while on the bottom were revolutionary. His teaching style was very patient, his demeanor affable, and his style seemed as though it would work equally well for no-gi, gi and mixed martial arts competitions. All the martial artists at Precision MMA in Poughkeepsie hope that Vazquez will come back soon to share more amazing techniques in the near future. Of the different martial arts offered at Precision MMA in Poughkeepsie, New York, most have very specific boundaries in terms of the techniques they incorporate and the disciplines they encompass. For example, Brazilian Jiu-Jitsu, which is on the Precision syllabus, has very specific rules in tournaments and though it can incorporate other styles like wrestling or Judo, when you watch a BJJ match you usually have a good idea of the kinds of techniques you may expect to see. 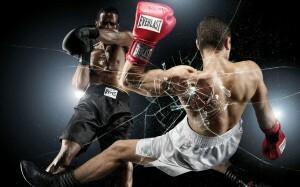 Likewise, boxing, also offered at Precision MMA, is very particular in it’s focus. No one has ever watched a boxing bout and wondered whether or not they were watching a Karate match, for example. However, the sport and martial art of Kickboxing has a much wider grey area in what spectators can expect to witness in terms of skill set, and what competitors can expect to learn when they sign up for classes. Though Muay Thai is, of course, a style of Kickboxing, and one which is offered at Precision MMA, it can have many differences from what one may witness at a local Kickboxing bout. Likewise, boxing is a part of Kickboxing, but has many differences from the latter as well. In this blog I will hope to clarify some of the arts encompassed under the umbrella of the term “Kickboxing”, some of the common rules of the sport, and how it is trained at Precision MMA in Poughkeepsie. Kickboxing, as a sport and martial art, has many different styles. One of the more common styles, which is taught at Precision MMA by local Poughkeepsie AKBF Champion Karl Nemeth and others, is Muay Thai. The style of Muay Thai allow kicks to the leg, body and head without shin pads, as well as knees to all these targets, elbows to the head and body, and punches, as well as clinching and trips. No matter what the rules of a local kickboxing fight, practitioners of Muay Thai will be likely to find success. However, going into the event it is very important that they know the rules because many techniques that are legal in Muay Thai may or may not be legal in a local Kickboxing fight. For example, leg kicks are often illegal in kickboxing, or if allowed the competitors will often have to wear shin pads. Knees are often not allowed in Kickboxing competition, or if allowed, they may not be legal to the head. Trips may or may not be allowed in competition, and the amount of time fighters are allowed to spend in the clinch can vary. Finally, elbow strikes are very often illegal in Kickboxing events, while they are considered possibly the most lethal weapon in a Muay Thai bout. Another common style of Kickboxing is the Dutch Style of Muay Thai, which is most notably represented in K-1 events. This style tends to combine the leg kicks, knees, clinching and elbows of Muay Thai, with the hand techniques, footwork and head movement of boxing, and the straight forward punching style and unique angular kicks of Kyokushin Karate. Precision MMA in Poughkeepsie, New York offers classes which cover techniques from both traditional Muay Thai as well as the Dutch Style and the common style of western boxing. Our instructors have been trained in all three styles and also freely exchange information with students who hold high ranks in arts such as Kenpo Karate, Shorin-Ryu Karate, Jeet Kune Do, and Takedwondo, in order to make sure that the kickboxing we offer, as opposed to other schools, is multi-faceted and never rigid. It is particularly important that we do this because some of our instructors and students who have had “kickboxing” fights in nearby Poughkeepsie have had to adapt to unusual rule sets, sometimes even mid-fight. For example, our instructor Karl Nemeth had one fight a few years back where he was told that kicks to the head were legal, and so he began landing them at will. However, it was then deemed that he was starting to do a bit too much damage with them, and the referee suddenly decided to make them illegal mid-fight. Though this kind of thing shouldn’t happen, because Kickboxing as a whole can have so many different rules and amateur fights are often more chaotic than professional ones, things like this do occur with more frequency than some might like to admit. There are both styles which allow and those which prohibit head kicks, and both are known as “kickboxing”, so a school like Precision in Poughkeepsie which is more versatile is likely to find more success in kickboxing matches with varied rules than some other schools. Because of our multi-faceted approach to the sport, coach Karl was able to have success in this fight even despite his head kicks being suddenly prohibited mid-fight, but for some other fighters from more rigid schools this sudden rule change might have led to defeat. Likewise, another one of our students had a recent Poughkeepsie Kickboxing fight where full body throws were legal and he did not become aware of this fact until his opponent utilized them in the fight. This is highly unusual. Some, in fact, many kickboxing fights do not allow trips or takedowns of any kind. Traditional Muay Thai Kickboxing does allow certain foot sweeps as well as takedowns which involve lifting an opponent directly off their feet and delivering them to the mat. However, even Muay Thai does not allow full body throws and slams done from unusual angles or which involve lacing the opponent’s legs. Nevertheless, because Precision MMA in Poughkeepsie also offers classes in Wrestling, Judo and Brazilian Jiu-Jitsu, which most of our kickboxers cross train in, the student in question was quickly able to get his bearings about him and use his knowledge of these arts to defend against the takedowns and win the fight. Once again, it was shown in this example that “kickboxing” as a sport can include any number of different rules, and that the more versatile one’s school is and the more multi-faceted their kickboxing program, the greater chance its students will find success in competition. One very popular style of kickboxing, which is often the basis for the rule sets of local events, is the American style. This sport came into popularity in the 1970s with fighters such as Chuck Norris, Joe Lewis and Bill “Superfoot” Wallace. The rules generally prohibit leg kicks, knees, elbows, or any sort of trips or takedowns and also disallow lengthy periods of clinching. Basically, the American style is more similar to boxing mixed with Kyokushin Karate than it is to traditional Muay Thai from Thailand. Though Precision in Poughkeepsie does offer traditional Muay Thai techniques which coach Karl Nemeth has learned from none other than world Muay Thai champion Kaensak Sor Ploenjit, we are fully capable of competing under the American rules. This is because we also incorporate so much boxing into our style, which our students learn from experienced boxing coaches, such as Derrick Ohlhoff, who is himself a three times Golden Gloves’ champion. When far fewer kicks are allowed, and knees and elbows are prohibited, then sharp boxing skills are that much more important in attaining victory. Most of our sport kickboxers cross train in boxing so that they can have success in bouts which have American rules, but this is unfortunately not possible for those martial artists at other more rigid schools which do not offer Boxing classes. Our school also has students who hold brown and black belts in styles of Karate like Kenpo and Shorin-Ryu, so if a student knows he is going to be competing under American rules he can cross train with them in order to gain a wider knowledge of upper body kicks in preparation. Another area of Kickboxing which is very subject to change is the length and number of rounds. In some local kickboxing events the rounds have been known to be as short as one minute or one minute and fifteen seconds. Other times the rounds may be a minute and a half, two minutes, three minutes, or even five minutes. Though most local kickboxing fights these days tend to be three rounds, there are cases where they are only two rounds, and there are also cases where a fight can consist of a total of five or even ten or more rounds. This wide variation in length and number of rounds can make preparation for an upcoming Poughkeepsie Kickboxing fight stressful and chaotic. However, because our instructors and students have competed in fights with so many differing round lengths and numbers of rounds, our students can properly prepare for any scenario. If the rounds are only one minute in length then our instructors will know how to train them, both psychologically and physically, for the short bursts of energy they will need to expend. However, if the rounds are longer, or there are more of them, then our coaches will also know how to prepare our competitors so they will have the necessary cardio and mental endurance to make it through wars of attrition. As can be seen, “kickboxing”, as both a sport and martial art, has many rule sets and many changing variables. To be prepared for these a martial artist needs a wide array of skills and first hand instruction from trainers who have fought under different scenarios themselves. Whether fighting under Muay Thai rules, Dutch or American Kickboxing rules, or some other variant, students of Precision MMA in Poughkeepsie, New York will be prepared to take home the gold. This is because we train under so many different conditions that if need be, we will simply beat you at your own game.